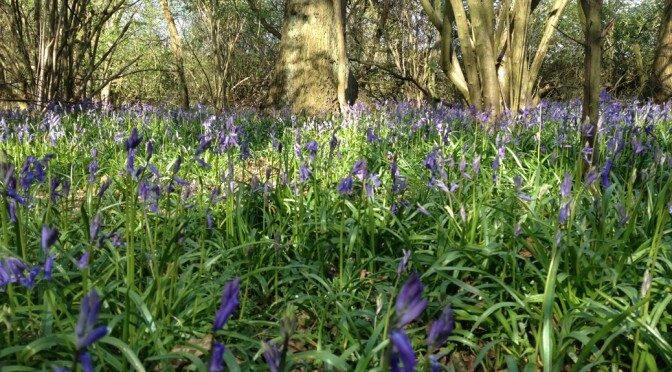 Today I was greeted by a sea of blue as I walked through Bourne Wood. The recent warm weather has seen the Bluebells begin to show across the woodland floor. We are lucky because this splendid show is only found in northern Europe, and Britain is home to more than half of the worlds Bluebells. Unfortunately their survival is threatened by people picking the flowers and digging up the bulbs, which is illegal because the Bluebell is a protected plant. So please do not be tempted; just admire them, each year, by visiting Bourne Woods! To soothe my spirit’s care”.